T: I: S, (Steinberg Recherche, March 8, 2010. 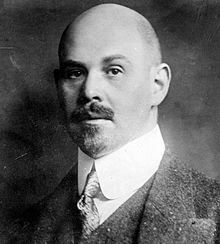 Walther Rathenau was a philosopher, businessman and minister of foreign affairs in the early Weimar Republic. He was also a Jew.He would now be classified as a Liberal Conservative or a right Social Democrat. All the same, many reasons for revanchists, anti-Semites, PI-ler, Mafiosis und Ulfkotte-people to hate him. So much so that he was murdered in 1922 by three so-called Fememörderern with a hand grenade. What we get to hear now too often in the debates about the supposedly necessary exclusion of potential terrorists and enemies of the Enlightenment in "our West", are the prejudiced conclusions of "the" History. But, THE history does not exist. Only stories do exist. Narratives that communicate what people think or thought that woul be important. One can make two things out of stories. To study them, in order to, in comparison with perceptions of current or historical events, create a better analysis. The first leads to ideological immobility. It will just be instructions for maintaining the taboo of other interpretations than the predetermined ones. Teaching about the Holocaust is often understood as a canonization of all this, what is said in the name of Judaism and the actual Israeli Government. But real Holocaust Education not only speaks of the suffering of millions of murdered Jews, but informs just as much about the construction of the will to genocide. Thus, of the tendency of acting by irritation and xenophobia. Stories about it are from all ages. The Holocaust story is "just" its translation into the industrial age of former pogroms and primitive ethnic cleansings. The First World War sacrificed millions instead of tens of thousands, as we were used to before, as it was an expression of the new industrial age. The second leads to free thinking about the ways, exclusion develops.It may be helpful to understand today's exclusion and their reasons. Good Holocaust education thus helps to understand how ideas about genocide do devlop themselves within a non-violent society..
That is why I think that critical historical studies are of importance. Also for Muslim immigrant children in Germany, Switzerland and Austria. They will understand that the Holocaust story is not about a so-called collective guilt of Germans and Muslims, but see it as awarning, never to follow extremists. And take seriously the warnings of the day.